"On devices, SPARCO® is working on steering wheels, in all sizes and materials, present on racing cars. Users will then be able to buy, along with the cockpit Evolve, even bundle of products to interface with their PC or their gaming console"
Des roues seules... ou un vrai système avec FFB? Intéressant. J'imagine qu'ils ont fait une étude de marché et que nous sommes une manne intéressante pour eux. Le sim racing prend de l'ampleur. Oui, intéressant tout ca . A suivre et voir niveau tarifs et réglages..
"Evolve is a car racing simulator. Research conducted by Humanetics® has allowed the development of a product that gives virtual pilots a highly immersive driving experience. The matte black coating and the glossy carbon fibre seat grant the Evolve simulator a distintive racing allure." 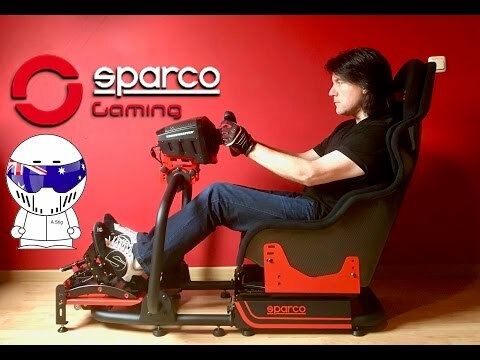 "The Comp gaming seat is the "luxury" model of the SPARCO® Gaming range of products. It is available in two versions: Carbonio (or carbon fibre) and Vetroresina (or fiberglass). 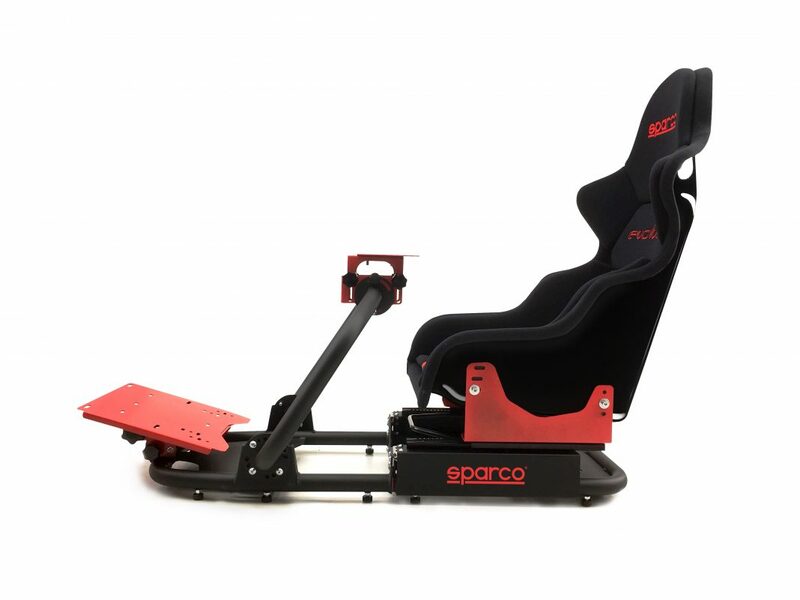 The Carbonio gaming seat is a flagship Sparco product, fitted with a backrest in the same composite carbon fibre used for the SPARCO® supercars. The seat reflects the design and comfort of the SPARCO® SPX seat. The gaming seat is upholstered in Alcantara® and synthetic leather, and allows the user to adjust the seat height and angle. The backrest reclines and provides fine lumbar adjustment. 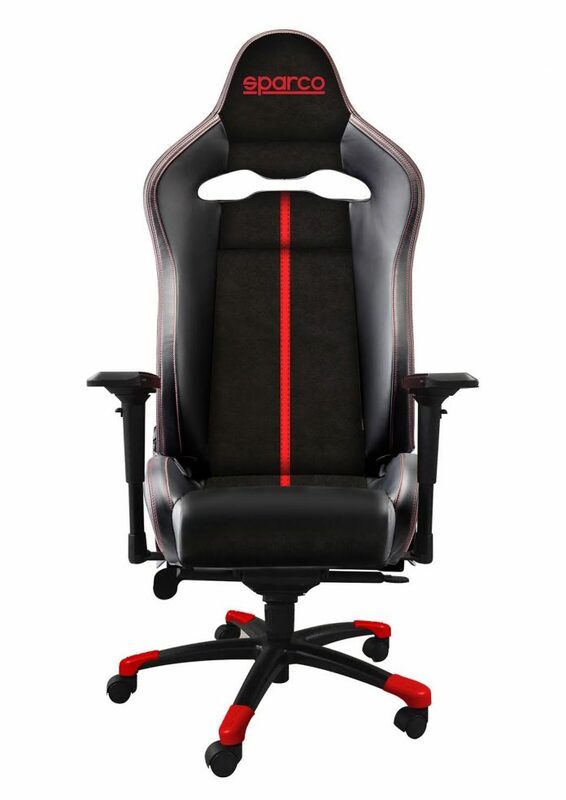 The gaming seat is upholstered with a sturdy fabric and has a mechanism that stops it from tipping over by preventing the back from reclining by more than 150°. Moreover, it also comes with a rocking mechanism and a polished aluminium base with an SGS / BIFMAX5.1 / EN1335 certified piston and 5 sturdy wheels. A TPU footboard prevents the feet from slipping while using the gaming seat. The arms are type 4D with multi-directional movement. The product will be sent starting from 01 Jun 2017." Mais bon, les roues ne sont même pas bloquantes... C'est nécéssaire avec un loadcell. "The Hypergrip glove revolutionizes the concept of racing gloves specifically with the Sim Racer and Gamer in mind. The gaming glove has been designed for use both with the steering wheels in various materials found on the market and with PC controllers and consoles. The micro-perforated microfibre on the palm ensures maximum ventilation without reducing the grip provided by the rubber coating. The perforated and stretch materials used on the Hypergrip glove ensure perfect fit and comfort for long gaming sessions, limiting perspiration and providing a second skin feel. The gaming gloves come with "touch-sensitive" tips on the index finger and thumb. These tips are reversible and can be removed in "controller" mode: with uncovered fingers, the gamer will exert pressure more effectively on the joystick buttons, ensuring rapidity and precision. The foam protections on the palm reduce the stress exerted on the hand by these devices." 800€ une chaise, haha . Non mais c'est horrible en plus. Franchement, c'est d'un goût. Qui voudrait d'un truc pareil dans son bureau? J'espère qu'au moins la possibilité d'incliner le dossier n'est pas en option.